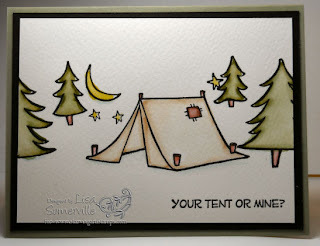 What better way to celebrate the end of summer than with some camping related cards! My boys actually did go camping for the night - so while they were away, I was thinking of them! Both of these cards make fun cards to give to the hubby too - maybe I'll hold one out for our anniversary next month - I'm sure it would make him chuckle when he opened his lunch box and found one of these cards! For both of these cards I used Starving Artistamps DoodleFactory - The Great Outdoors and the Marker Watercoloring Technique (TJNL)- which work perfectly for colorbook stamps! I took the less is more approach by not adding a bunch of layers to my focal image - as I kept that piece 3-3/4" x 5" and just layered on my base card. For those of you who've been using the discount code for Starving Artistamps - I just wanted to let you know - there have been some changes with the discount code. The new code is save10LS this will give you 10% off all Starving Artistamps and DoodleFactory stamps. oh my...these are cute! 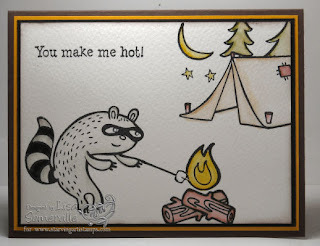 That raccoon makes me laugh...looks so much like a bandit. OMG, these are so funny!!! Those would be perfect cards for your hubby! Too cute! Are the sayings also from the same company or did you print them on the computer?